Even though Miele has been building vacuums for more than 80 years, they are not as well known in households as some other brands. This is likely because they are considered a higher end brand that focuses a lot on quality and durability. It’s not uncommon for their vacuum cleaners to last for decades. Their strict testing policies almost guarantee their products will last, even under the constant use of a typical family household. As a matter of fact they put each model through the equivalent of 20 years of typical use to make sure what they are selling will indeed last. Simply put, surpassing the industry standard and exceeding the expectations of their customers with each and every vacuum they build is their company goal. Ever since they started their company this has been what they strived for, and continue to do so today. It’s good to have a company stand behind their vacuums when you buy from them. Their philosophy focuses on providing completely clean exhaust air, without question. The only way to do this is to have a highly rated filtration system with several components working together. With Miele, they call this their AirClean filter system and it is made of a perfectly designed HyClean™ dustbag, a motor protection filter, and an exhaust filter. These three components work together to remove more than 99% of those microscopic allergens like pet dander, dust mites, and mold spores (when using their HEPA configuration). You cannot have clean exhaust air without this, so this is where it all starts with their lineup. Not only are their dustbags great at trapping dirt inside they are also built in a ‘green’ way. The material they are made with is a softer composition designed to efficient even when vacuuming at a lower power level. This has been tested to save on energy as you don’t always need to put the machine to max suction power. Each bag also provides a dust-free hygienic replacment by fully sealing up immediately upon removal. Nothing can escape out onto your hands or clothes, so there is nothing to breathe in like some of the cheaper bagless models have. 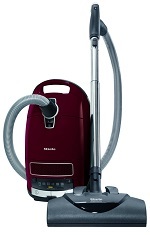 Miele has also won multiple awards in the household cleaning industry. One example is the Good Housekeeping Seal that was awarded to their dishwashers and vacuum cleaners. This is a very prestigious award because to earn that Seal a product has been thoroughly evaluated by the scientists, engineers and technicians at the Good Housekeeping Institute (GHI). The GHI is the oldest lab that tests consumer product brands in the USA. 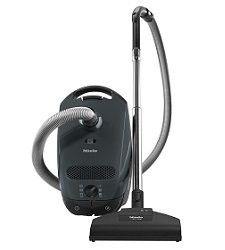 The Miele Dynamic U1 upright is one of their full sized uprights designed specifically for entire household cleaning of carpets as well as hard floors. It currently comes in three different configurations (Maverick, Jazz, and Cat & Dog) depending on the main type of cleaning you will be using it for. The biggest difference between them is the attachments, as they all have the standard 1200 watt Vortex motor and fully sealed HEPA filtration system. A rotary power dial also lets you adjust the suction for higher piled or thick carpets right on down to smooth flooring like tile and laminate. Switch the brushroll off for those delicate floors as well so you aren’t scuffing or damaging the surface. While it really shines on carpeting, Miele made it simple to use it on any type of flooring. Other features include auto height adjustment, various attachments, lightweight aluminum telescoping wand, and a 7 year motor and casing warranty to provide years of worry free protection from any failure. They are one of the few companies who stands behind their products with multi year warranties, largely due to the tremendous testing they put them through. Click here to read our review and get more detailed information to help you decide if it’s the best choice for your household. 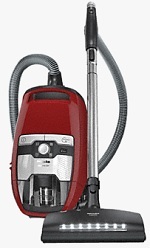 The Miele C3 Soft Carpet is a full sized total household cleaning machine with enough power for the deepest of carpets. It actually has a dedicated SoftCarpet setting which puts maximum suction into the included Electrobrush in a more gentle way than you might expect. The engineers went the extra mile of not only making this model very effective at cleaning carpets but also gentle enough to not damage them like some other brands are known to do. Fully sealed HEPA filtration also removes more than 99% of tiny dust particles from the air as it passes through the various filters along the way. The dustbags immediately seal themselves upon removal to trap everything inside. Many bagless vacuums cannot do this since their collection bins will let dirt escape as soon as the release is pushed. You can almost see the dust travel back into the air but this simply does not happen on a bagged Miele like the C3. Read our review of this model where we highlight the strengths and weaknesses, to help you decide if it’s the best choice for your home. If you are interested in a canister and aren’t sure where to start, here is our C1 vs C2 vs C3 comparison where we break down the main differences between them. Hopefully you will find this useful. 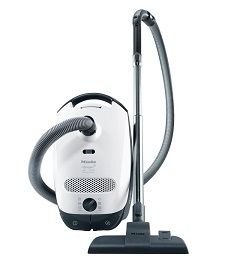 The Miele C2 Compact Electro+ is a lightweight model with a compact “space saving” design. 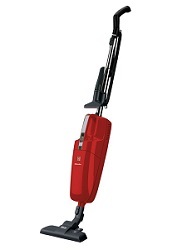 It comes with their ElectroBrush which has an electrically powered brush roll to handle all types of carpeting. For high piled carpets you can turn the power up to make sure you are pulling those tiny allergens up from the deepest parts of the fibers. Like most of their vacuums, the C2 comes with their AirClean system with a HEPA exhaust filter that is rated to trap virtually everything that passes through it. The fully sealed design and quick sealing dust bag make sure that all the debris stays inside the machine where it belongs. The most unique feature of this model is the ‘Compact’ design which allows you to store it in a much smaller space than other canisters. The Park System on both sides allows the handle and hose to attach in such a way that they don’t take up much room, and the sleek body will fit in a tiny closet or on a shelf. It’s an ideal choice for apartment dwellers or those in a smaller home too. Click here for our full review to learn more about it. 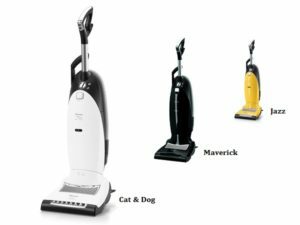 The Blizzard CX1 lineup consists of 5 different bagless canister vacuums from a company that is known for producing the highest quality ‘bagged’ models. These aren’t your typical bagless cleaners though. They come with the same powerful Vortex model that powers many of their other lineups. Plus the HEPA filtration is rated to capture virtually all tiny allergens so nothing can escape back into your home. The collection bin is different as well. It has two different containers inside that work together to trap large and small particles. A hygienic emptying system means you won’t be touching any of the dirt as well. Simply empty it into the garbage with the push of a button. It also has a self cleaning design so you won’t have to put your hand inside to fish out any leftover filth. Click here to read our full model review and comparison to see if it makes sense for your home. The Miele C1 Olympus canister is their lightest cleaner, weighing in at a mere 13 pounds. It is extremely maneuverable and easy to carry up multiple flights of stairs. The stainless steel telescoping wand lets you reach high for those corner cobwebs or dusty curtains. Plus, it has 3 onboard attachments for non-floor surfaces like furniture, beds, and even countertops. It is mainly designed for harder floors and low pile carpeting, as it doesn’t come with a dedicated carpet attachment with spinning brushes. This model will struggle on any thicker rugs but that is not what it was designed for. They have larger, more powerful models like the Complete for those cleaning applications. Like their other models it comes with a Vortex motor, 7 year warranty on most parts, and their “Silence System” which dampens the noise during use. You can even vacuum the floors while your little one is sleeping close by, which is not possible on most brands. Overall it’s a solid choice as long as you have the right types of floors in your home. Click here for an indepth review on this model to see if it’s something that makes sense for your family. Another one of their lighter weight C1 canisters, the Capri PowerLine is very adept at cleaning hard floors and low to medium pile carpets. It comes standard with two different floor attachments: the Turbo Comfort Brush and the Parquet hard floor tool. The Turbo brush has spinning brushes to agitate dirt particles in the carpet fibers and the Parquet has soft bristles to gently clean smooth surfaces. It is ultra lightweight and very portable so you can easily move it around your home. The stainless steel telescoping wand is very durable and can be adjusted by pushing a button. You can also change attachments with a quick click which is good because it is designed to clean a wide variety of surfaces. The upholstery and crevice nozzles are integrated right into the body along with the dusting brush for quick access and storage. It is very versatile but not ideal for thicker carpets. Our full review goes into more detail of the strengths and weaknesses to help you determine if it’s right for your household. 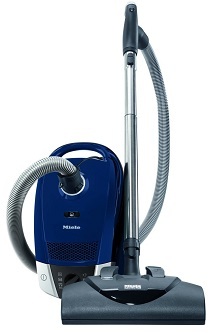 The redesigned Miele Swing H1 is not your typical stick vacuum. It comes with multiple filters (with optional HEPA), a 1000 watt powerful motor, and a multi-layered dustbag that is specially designed to keep dirt particles trapped inside. Pet owners can even purchase a carbon activated filter to help remove those difficult odors from the air during cleaning. You can also operate it in multiple configurations using a variety of attachments for just about any floor type. There are different carpet and hard floor tools, crevice tools, and a durable stainless steel extension wand that will last much longer than the competition. You can use it on low to medium carpets, bare floors, and any ‘above the floor’ surface that needs cleaning. The Swing H1 is definitely one of the best stick vacuums available today. Read our review for a rundown of all the main features to see if it makes sense for your needs. 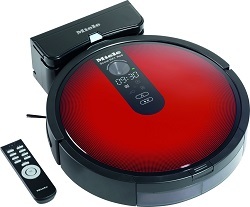 The technological powerhouse called the Miele Red Scout RX1 Robot Vacuum has quite a few built-in features to set it apart from the competition. It is designed to work on a regular schedule to do the cleaning tasks that you don’t want to. Four different modes can handle just about any requirement you have. The basic Auto Mode will clean upwards of 1600 square feet before returning to the base charger. The Turbo Mode works similar to Auto but with fewer passes to save time. This is good for a quick once over of your home. The Corner Mode works close to the walls and corners to allow the side brushes to pickup dust that gathers there. And the Spot Mode cleans a small area quickly and thoroughly as needed. The Scout may not be as well known as other brands like Roomba but it can certainly compete with them on functionality. Click here for our review of this robotic vacuum cleaner, including a video demonstrating how it works.